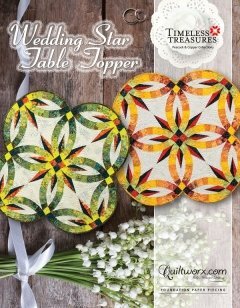 The Wedding Star Table Topper pattern is Judy’s original Wedding Star design downsized to a 2 ring by 2 ring layout, measuring 30” x 30”. This design makes a great teaching tool due to its small size. It is also just a cute size and makes a great companion project to the large quilt sizes or a stand alone accent to any table you may have in mind! This design has become a classic in the quilting industry and is one that continues to sell more each year than it did the year before.